I have named this noren "Soaring"
My favorite origami form is the crane. No matter how many years I've folded, no matter how many kinds of cranes I've fashioned, I never tire of this classic fold and all its variations! This noren I call "Soaring". It was inspired by the book "Origami: Rokoan Style, by Masako Sakai and Michie Sahara. 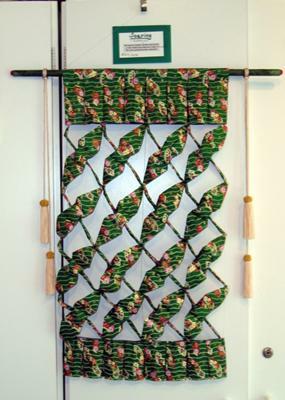 In Japan, a noren is a traditional fabric divider that hangs in a doorway. The following is a brief description of my process, and not intended as a step-by-step tutorial. I hope you will try to create your own connected crane noren. For this creation, I used a full sheet of Yuzen paper. This is a beautiful paper with patterns like the textile version of Yuzen used for kimonos, thick with paint and metallic highlights. I included the white margins in my plan, and by folding only, I divided the paper into as many even squares as possible. I left a wider rectangular section at the top and bottom of the paper. I then made my incisions and began to fold the section of squares into cranes. I later made slits starting from the top edge of the paper and several inches long, just enough to fold over to make a "casing" for a curtain rod. I then pleated the top and bottom, allowing the folded cranes in the center to determine the width of the pleats. The work was quite heavy, so to keep the shape of the finished model, I used clear nylon fishing line to secure the rows of cranes from the back. I made a hanger from a small wooden dowel covered with green paper, with end caps of red beads, and further enhanced with simple tassels. Finally, I suspended the noren from fishing line to create the illusion of floating.